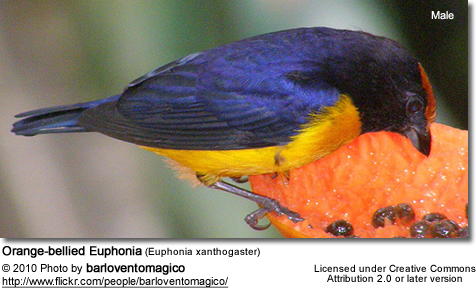 The Orange-bellied Euphonia (Euphonia xanthogaster), formerly known as Orange-bellied Tanager, is a finch found in Bolivia, Brazil, Colombia, Ecuador, Guyana, Panama, Peru and Venezuela. Its natural habitats are subtropical or tropical moist lowland and montane forests. 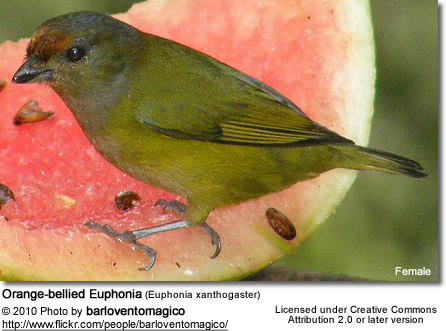 Their diet consists of a variety of tree-borne fruits.In particular, they are known to feed on mistletoe berries. Their gut is specially adapted for mistletoe berries, which are poisonous. These finches tend to move to places where mistletoe berries are the most abundant.